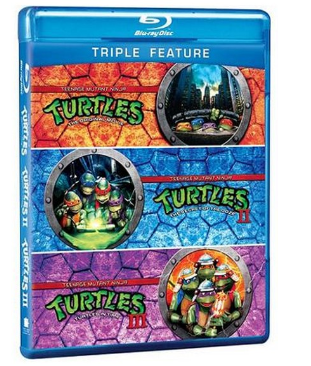 Teenage Mutant Ninja Turtles Triple Feature Blu-ray DVD $6.96 + FREE Store Pickup! You are here: Home / Great Deals / Teenage Mutant Ninja Turtles Triple Feature Blu-ray DVD $6.96 + FREE Store Pickup! If you have boys who love these fun crime-fighting turtles, they are sure to enjoy this! You can snag this Teenage Mutant Ninja Turtles Triple Feature on Blu-ray DVD for just $6.96 right now! Shipping is FREE when you select Site-to-Store Pick Up (if available in your area)!